A group of Cree youth is gaining more participants as they continue their trek from northern Quebec to Ottawa. A group of Cree youth, between the ages of 11 and 21, is continuing its trek this morning from northern Quebec to Ottawa. 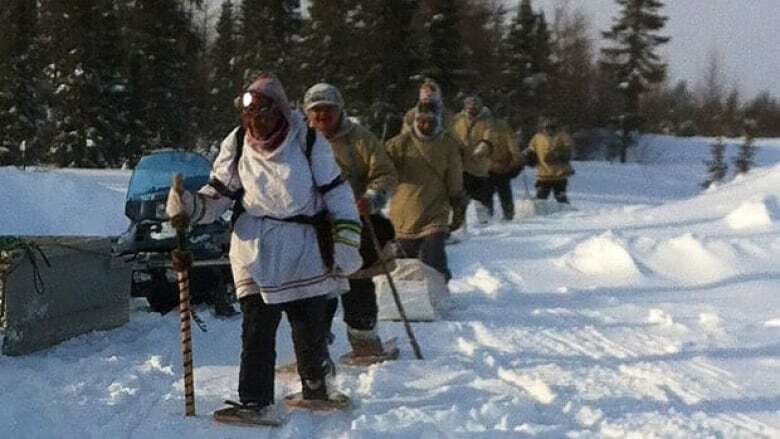 Six youths and one guide left the James Bay Cree community of Whapmagoostui on Jan. 16 on their walk, called 'The Journey of Nishiyuu', which means the Journey of the People in Cree. They arrived in Chisasibi Friday, which is 250 kilometres from Whapmagoostui, and hope to reach Ottawa in mid-March. Their goal is to support the Idle No More movement and to raise awareness of their culture and the environment. Matthew Mukash, a former Grand Chief of the Grand Council of Crees in Quebec, said what the young people are doing is not easy. "There are a number of challenges — first is the elements. You have to face the elements in the wintertime. The cold and the storms and stuff like that. And also at night it's very cold. You have to make sure you don't get cold when you're sleeping," he said. Mukash said it's also hard for members of the group to be away from their families for so long. Still, their numbers have been growing steadily over the past two weeks. There were seven walkers at the start, and now there are 26, including an 11-year-old girl, Abby Masty, from Whapmagoostui. Abby's mother, Rita Masty, said she is proud of her daughter. "Of course I worry about her and about her safety and the cold nights there will be during that journey. But I have faith in my daughter that she will be well-taken of. I was so happy that one of the walkers will be a woman," she said. Masty said her daughter had a dream that she would stay with the walkers all the way to Ottawa. The journey has attracted international interest, with close to 23,000 people following it through a Facebook page. They will have walked close to 1,300 kilometres by the time they reach Ottawa.